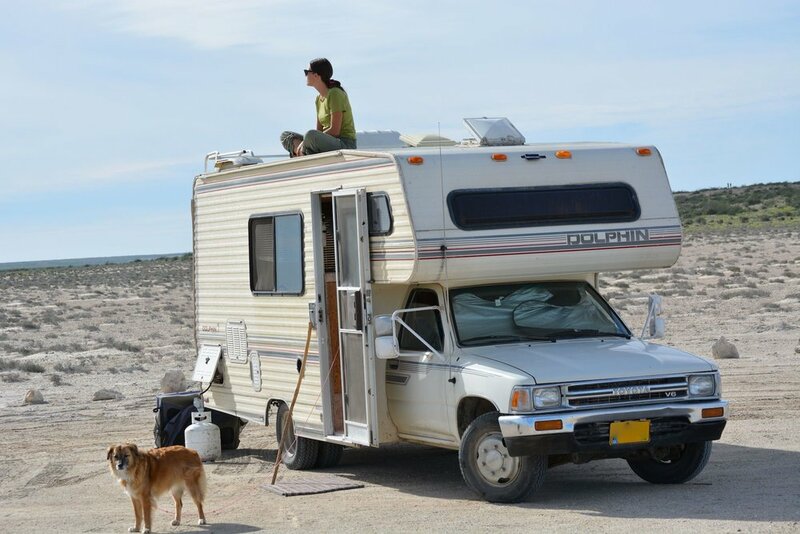 Last winter Tom and I camped on a gray whale birthing lagoon, and went gray whale watching in Baja Mexico. We went into this particular excursion pretty blind. Many, many people told us that visiting Ojo de Liebre (the largest gray whale birthing lagoon) in the winter absolutely COULD NOT be missed so we just decided to drive out there and see what all the fuss was about. As soon as we pulled up to the lagoon we understood! This was probably the most incredible of all the places in Mexico we had visited. Literally every time we looked out at the water there were several whales breaching, spouting, spy hopping, it was unbelievable. What was even more unbelievable was the fact that we were two of just a few people camped there. As soon as we chose a camping spot I climbed on top of La Peregrina to whale watch! I was blown away by the sheer number of whales in the lagoon, and it’s such a serene, quiet spot that it was easy to hear the whales spouting. 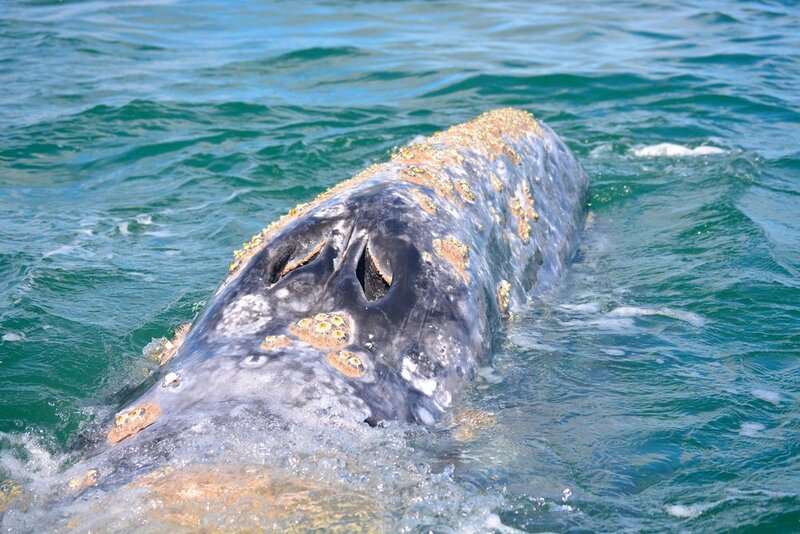 The annual gray whale migration brings thousands of whales to this spot every year! The following morning we paid to take an actual whale watching tour, and we were pleasantly surprised that the tours go out in small pangas, which are motorboats that only hold 8 people, including the captain. 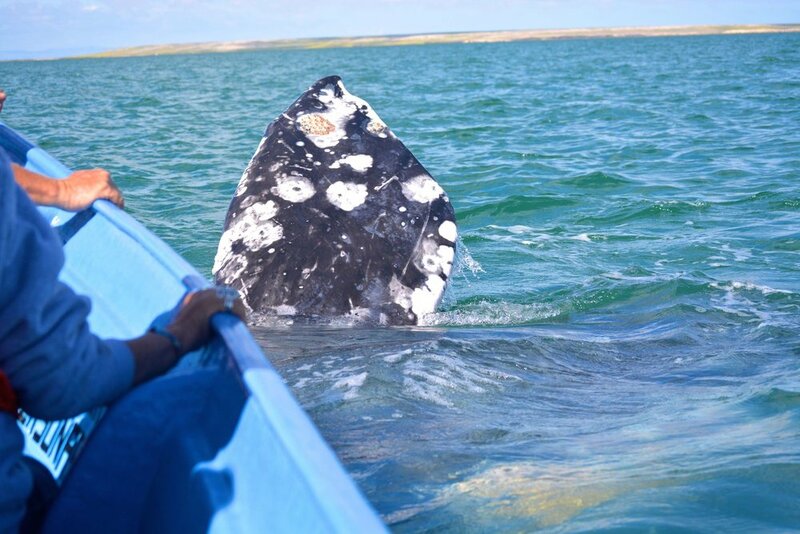 Just 5-6 small pangas are allowed to go out into the lagoon each day, which ensures that the whales are not harassed. Our panga motored out into the lagoon, and then the captain killed the motor and told us to wait. It didn’t take long at all for a mother whale and her calf to approach the boat. The calf was clearly curious and playful, swimming right up and under the boat. The mother seemed to enjoy rubbing against the boat, and even pushed her head right up next to us. She swam from one side of the boat to the next repeatedly, floating right at the surface, and often looking up to make eye contact with us. The entire tour lasts just an hour and a half, but that turned out to be plenty of time! Several different whales approached the boat, a few of them floating right next to us for long periods of time. It definitely felt like the whales were playing with the humans. It’s important to note that the whales are not fed or baited in any way for these tours. Historically gray whales were known for being fearless, and whalers were afraid of them because gray whales would actually attack whaling vessels. It was amazing to see how that fearless nature is redirected into playful curiosity when humans protect the whales rather than hunt them. 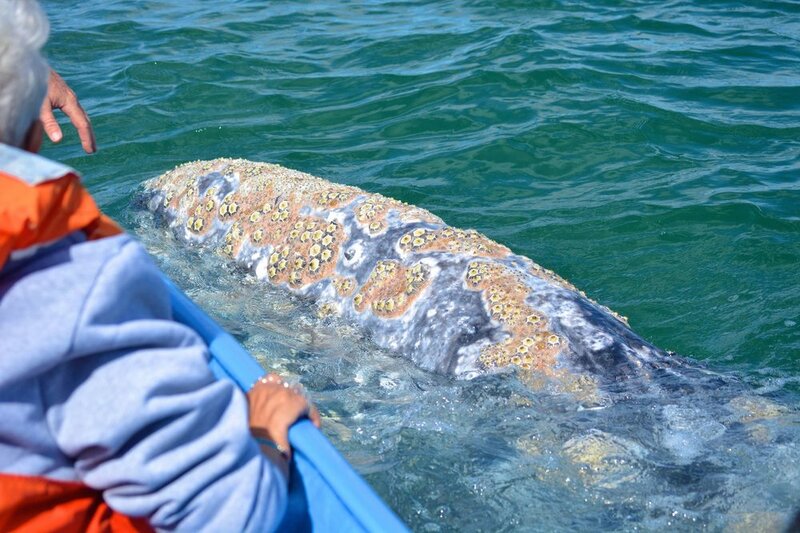 So when is the best time to see gray whales in Baja? 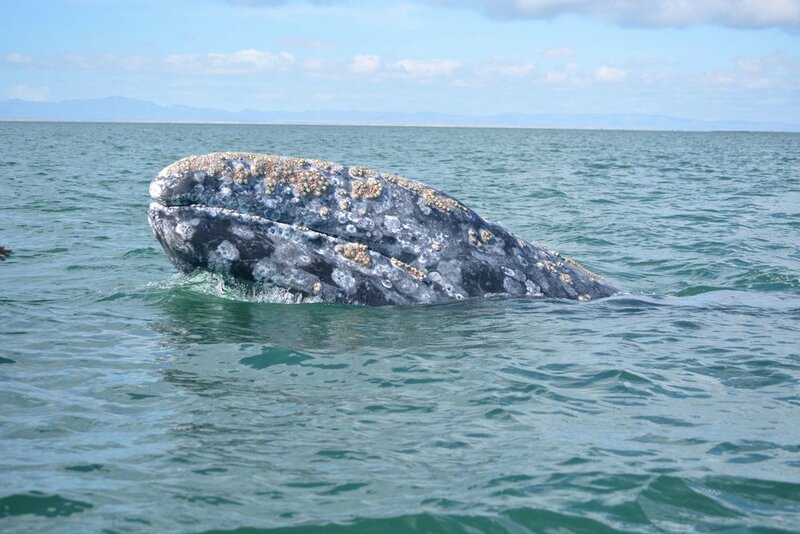 We highly recommend gray whale watching to anyone who is traveling in Baja from January to March (that is the best time for whale watching). As others told us, DO NOT miss this amazing experience! In fact, I would go so far as to say that no trip to Mexico is complete without a stop at the gray whale nursery. There are a few lagoons where you can go whale watching in Baja. These include: San Ignacio Lagoon, Magdalena Bay, and the lagoon we visited, Ojo de Liebre. Based on our conversations with fellow travelers, Ojo de Liebre seems to be the best place for whale watching in Baja, but I have no doubt all three lagoons offer a lovely experience. We consulted this book for information gray whale watching, and also for many of our other Baja adventures. We absolutely feel it is a must-have text while traveling the Baja peninsula. 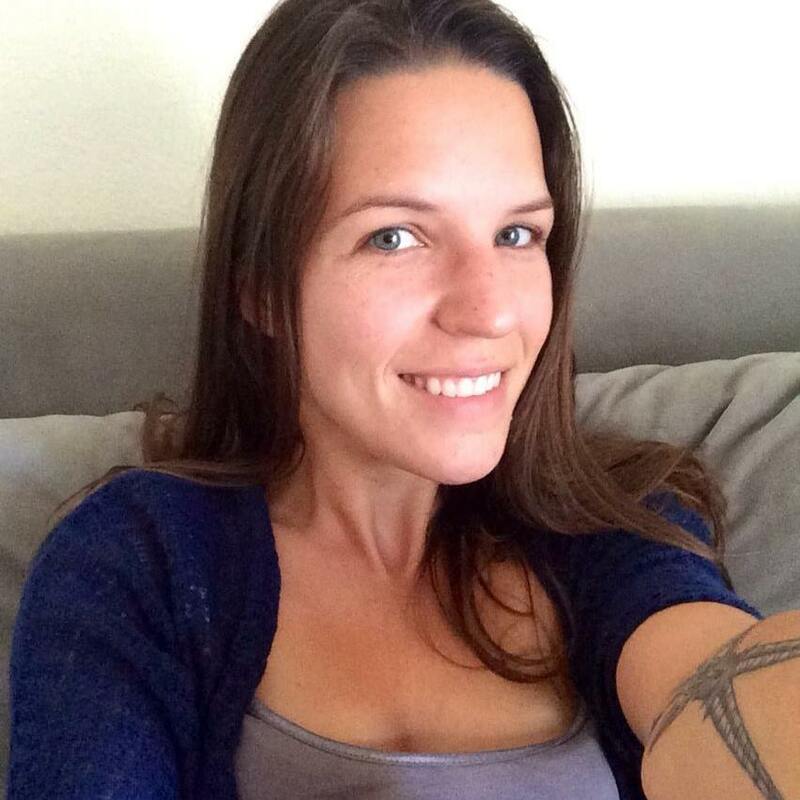 Click here to read about more of our Mexican travel adventures! To see our gray whale watching video blog click here.